From day one we’ve longed to see city-wide transformation through the gospel of Jesus. That’s why we are so dedicated to making disciples of Jesus. We want people to know Jesus, love Jesus, worship Jesus, enjoy Jesus, and spend eternity with Jesus! As we look at our city we know that there is much work still to be done. There are many people who have yet to meet Jesus and place their faith in the God of the Bible. So, more disciples need to be made and more churches need to be planted for us to see city-wide transformation through the gospel of Jesus. By God’s grace, let’s pray together that God will empower us to leave a spiritual legacy that lasts, as we live for the future God has for us. WHAT ARE WE COUNTING DOWN FOR? The New Year!! On January 1st we begin a new year. As a church we want to be laser focused on the mission God has called us to. We want our hearts and minds to be in tuned with what the Spirit of God is already doing in our city and join in with great passion and zeal. Our hope is God would mightily help us reach more than we could even ask or imagine. So, starting November 23rd we will count down to January 1st, and we are encouraging everyone to join together in prayer over the key initiatives we have planned in 2019. Every fruitful mission through the gospel begins with prayer. 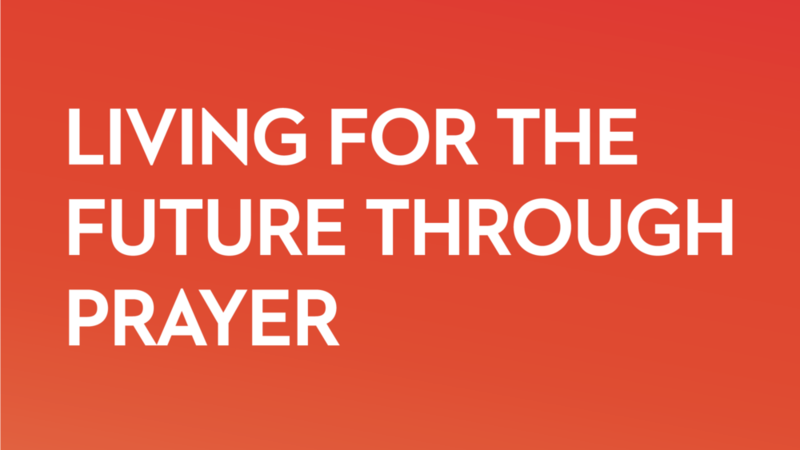 During the Malachi: Living for the Future series, we will be setting aside 40 days to pray boldly that God would move powerfully in our midst through our efforts on the mission he has given us to make disciples and plant churches. Prayer is God’s invitation to partner with him that his will be done on earth, but equally, in prayer our hearts are transformed, becoming ever more aligned with God’s will. Within Matthew 28:19–20 God’s great commission is found, to “make disciples of all nations.” We are confident of this: God always has a bigger vision and more exciting future than we can ever imagine (Eph. 3:20). Therefore, we want to prepare for this next year by praying corporately and individually to be united on the mission God has for us. Southtown is the arts district of San Antonio and is one of the least churched areas in our entire city. It is also the location of our largest community group. Over the past year we sensed The Lord leading to start an evening service to provide an opportunity for those who would never attend church on a Sunday morning an opportunity to know and meet Jesus. We’ve waited on God’s direction and we believe he is asking us to step out in faith and work diligently this next year to see a gospel-centered church presence in Southtown. Our hope is that hundreds of people would come to meet Jesus and become disciples over this next year in Southtown. UTSA is one of the largest and fastest growing universities in our state, and by some estimates, even the nation. UTSA is growing at a rate that is hard to keep up with and is projected to have a total of 45,000 students enrolled over the next 10 years. It is estimated that about 3% of the campus are Bible believing Christians, and with the attendance continuing to climb more workers must be sent into the harvest. We already work closely with campus ministries BSM and CRU. Our hope is to be able to help support gospel ministry on the ground by sending laborers and resources into the harvest of UTSA. Over the past year, Acts 29, the church planting network were are a part of, has made significant headway in pioneering initiatives in the Middle East among the world’s most unreached people groups. There are millions upon millions of people who live in this part of the world, with almost zero access to the gospel of Jesus. We believe God is opening up an opportunity for our church to join him on His mission in the Middle East, for us to partner with a developing network of church planting churches. Last year, by God’s grace we were able to launch our mercy ministry to care for the need of those in our congregation who are in crisis or in challenging circumstances. This ministry offers assistance in assessing people’s needs and working together to find solutions. This year we hope to not only to grow this ministry internally but to take steps toward expanding outside the walls of our church and into the city to care for those in crisis there. The Lord has done great things in our midst over the past year and we long to see him do more! As we think in terms of legacy, lineage, and future we are aware of many people in our church (or their extended family) fighting sickness, disease, addiction, abuse, and infertility. During this season we want to come together as a church and ask God to do far more abundantly than we can ask or imagine by healing and strengthening the faith of many in our congregation. Starting January 6th we will begin a 42 week study through the gospel of John. John says that the purpose of his gospel is that people would put their faith in Jesus. From day one, this has been our top priority. We love to make much of Jesus, point people to Jesus, and we love it when people trust and obey Jesus. Throughout our study of John we are praying that this will be a great opportunity for many people in our city to come to meet and know the Jesus of the Bible. Biblically, prayer and fasting go hand-in-hand. Fasting is a form of worship that Israelites and Christians have practiced throughout history, and prayer has always been an integral part of fasting. At the end of our 40 Days of Prayer we will start the new year with five days of fasting. We encourage you to join us in a Biblical fast, abstaining from food January 1st to sundown on January 5th. This could be fasting from one meal a day or fasting during daylight hours. If you are unable to fast from food, consider implementing spiritual disciplines that would change your normal rhythms and create more time for prayer during this time (for example, cut out T.V., internet, games, etc.). Choosing to abstain from them will allow you to use that time to read Scripture, pray, and rely on the Lord. As our time of fasting approaches we will be posting information and practical tips on fasting here at our blog. Your gifts build a legacy to fulfill God’s vision for our church and to equip the next generation of disciples of Jesus. During these 40 days of prayer and 5 days of fasting, we are praying for $30,000 over and above our regular tithes and offerings to fund these endeavors in 2019. We believe Jesus has given the vision, so we trust that He will graciously provide the means to do it through His people. If the Holy Spirit leads you to give during these focused days of prayer, please visit thewellsa.org/give or click the link below.